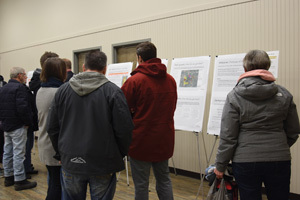 Residents were given the opportunity to review the plans for a new high school and recreation complex in Coaldale last week. The first of two information sessions on the proposed high school and recreation facility was held on Tuesday, Feb. 5. The room in the Hub building where the session was held was packed with interested parties, despite the cold temperatures outside, and representatives from the town and Palliser Regional School Division on hand to answer questions. A second session is scheduled to go this evening. With Kate Andrews High School nearing the end of its life-cycle, and the schools that flowed into it bursting with students, a new school is needed in Coaldale. At the same time, a new recreation facility is needed for the community. This presented both the town and Palliser with a unique opportunity to potentially combine the two facilities and make better use of them. “If you are able to look at, you know, what they did in Strathmore, with the elementary school and the rec centre, that facility has a lot of utility and use that it wouldn’t have, if it was just a stand-alone facility,” said Kim Craig, mayor of Coaldale. “One of the things that happened in some of these recreation facilities, is that they’re used at nighttime and weekends, when people are free, right? The Town and Palliser have forwarded a proposal to the Alberta government to build the new school and rec facility. If approved, it would be the first new school in Coaldale since Jennie Emery Elementary School was built in 1994 and the first new recreation facility since the curling rink was constructed in 1980. Kate Andrews was built in 1959, and was last updated in 2004. “If you take football fields and tracks and baseball diamonds, all of that, it is a very expensive proposition,” said Dexter Durfey, secretary-treasurer for Palliser. “If we can somehow share that cost with the community, not only does the community get after-hours, weekend, summer use, now you also have a school that has access to a lot more physical facility opportunities, like tracks and fields and all of that. If you look at the current Kate Andrews site, it’s very limited in terms of space for those kinds of things. However, while people can agree that Coaldale needs a new school, there is a disagreement on the location. The proposed site for the new school and rec complex lies north of Highway 3, west of the Birds of Prey Centre and on a parcel of land associated with the Malloy Basin Stormwater project. At a December 2018 public hearing to rezoned those lands, several attending residents made it clear they were not happy with the proposed location and use of those lands for a high school and rec complex. There were also questions about why there wasn’t more consultation before the location was decided. According to information presented at the info session, the decision had to be made fairly quickly, as prior to June 2018, a new school was not on the town’s radar. Although the town had started gathering information the previous year on what recreational opportunities their residents were looking for, it wasn’t until Palliser officials revealed that a new high school in Coaldale was considered their highest priority to town council in a joint meeting that the possibility of combining the two arose. However, it did mean that the town had to act fast, as in September, the town and Palliser learned the province was hosting a Value Management session for the evaluation of a new high school in Coaldale, scheduled for Oct. 25-26. Rather than declining the opportunity — and risking the province evaluate another school instead and five years for an announcement — the town decided to put together a proposal to meet the timelines and stay in the running for a potential April 2019 new school announcement. This meant the site selection process did not follow the typical process, and town council had to make a decision fast. “We didn’t have an opportunity for the school up until last year right? June of 2018 is when the opportunity kind of presented itself for the school. It wasn’t something that was even potential, you know, two or three years ago kind of thing,” said Craig. “The opportunity evolved in very short order, and Palliser realized that. Remember a while back, they were looking at reconfiguring all the grades in Coaldale because some of the schools were over utilized and that, and then they had to look at grade configuration, and that was all predicated on over-utilization of the elementary schools and whatnot. Craig acknowledged the concerns from residents that their voices weren’t heard in the process, but said it “wasn’t planned”. “You have a potential opportunity to have a brand new high school that can really set the stage for the future of education in Coaldale, and make all the other grades a little bit more palatable and give more longevity to some of the elementary schools by doing this,” said Craig. Although the town ultimately chose the site, they had to abide by a list of requirements that Palliser had for the school that needed to be met. “The way the process works in Alberta for school land, is the municipalities have to provide land for schools to be built on within their communities, and so really, at the end of the day, school boards are given land, and the town decides where that land is. However, there are parameters that we have to have,” said Durfey. “One would be the size, so for a high school, this school that we’re talking about would house grades 7 to grade 12 students, and so in our view, when you start talking about football fields and tracks and things like that, you probably need it to be about 20 acres, would be ideal. Although he didn’t know Coaldale very well, as he wasn’t from the area, Durfey said that the elementary, middle and high school being in one general area was causing some traffic congestion issues. Traffic is also a concern with the proposed north-side location. For those living on the south side of Highway 3, accessing the school and rec complex would mean crossing a major highway and rail line, for which there is only one traffic-light controlled intersection to cross the tracks, located at the 20th Street intersection. The other intersection that would potentially be used to access the site is located at 30th street, which has only stop signs and gives right of way to a 70 km/hour section of busy highway. The town is working with Alberta Transportation on solutions to upgrade that intersection. Additionally, Durfey said more kids would be eligible for bussing to the proposed high school location. Craig noted that the students attending the proposed high school would be driving, “and more mature and have an awareness about safety innately”. There are also people living on the north side of town that cross the tracks and highway on a daily basis. “Highway 3 of today is a lot different than it has been years and years ago. Before, Highway 3 used to go right through Main Street Coaldale for heaven sake and whatnot. The speed zones and 50 and 70, there’s slower speeds and whatnot,” said Craig. Five other sites were considered for the school and rec complex, which were located south of the highway. However, capital costs for those locations were higher than the chosen site, with the exception of option ‘D’, the location of the existing school site. Another advantage the north side location had compared to the rest is that the town did not have to acquire more land for the school and rec complex to be built. All of the sites were fact-checked to be sure, and with the numbers and logistics that at came back from the planners and engineers, Craig said the numbers “corroborated” the decision to go with the north-side site for the school and rec complex. Another concern that had arisen over the site was the placement of a school and rec complex there was contrary to the recommendations of an Integrated Development Strategy (IDS) done in 2012, that recommended the area be used for things such as stormwater retention, ecotourism or a campground. Although the IDS gave the town ideas for the future, there wasn’t a lot of planning done for it, and it was never formally ratified. Additionally, as it was made possible through use of a grant, it didn’t get a chance to go further, as the town did not have the ability to implement it, as they didn’t have the funds or resources. The cost of the recreation centre has been estimated at $10 million, which the town plans on funding through a government loan, or debenture. The town plans on paying that through the use of a $10 recreation levy on the 3,300 household in town, over a 25 year amortization at a 3.35 per cent annual interest rate and through other recreation levies, housing growth and general operations. This does not include sponsorships or other sources of funding. The cost of building the school is estimated at $38 million, which will be paid for by the province, although Palliser and the town may add additions items — such as a regulation-sized soccer/football field and rec complex — at their own expense. Although the $38 million price tag is more expensive than the $25 million option to simply modernize Kate Andrews, the new school will have more longevity to it, allowing students to enjoy the space for longer before renovations are needed. Murray Grigor has two kids who attend Kate Andrews, and two more in younger grades, and he questions the lack of public consultations around the school. Although he would like to see a new school in Coaldale, he questioned why Kate Andrews was the one that needed to be replaced, as it was at 53 per cent capacity. Even if a new traffic light is put up at the 30th Street intersection, that doesn’t mean everyone will be using that intersection to get across. Pointing out that not every kid has access to a car, Grigor said some may just cut across people’s yards to get to where they want to go. Additionally, as the majority of Coaldale’s population lies south of the highwa, and there is more residential development in the south part of the town, he says it makes more sense to build the school there. The second information session will go tonight at the Hub building from 4:30-7:30 p.m.